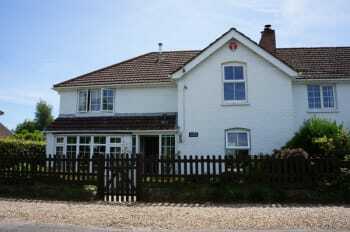 Heather Cottage B&B is just 1 minute's walk from the open forest, on a very quiet lane at the edge of Sway, in the New Forest National Park. The nearest pub/restaurant is 8 minutes walk away, the village centre is with restaurants and shops and the main line station is 15 minutes. 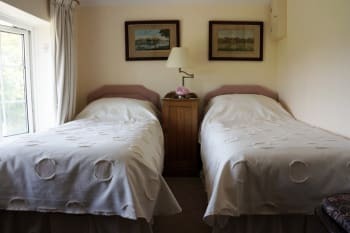 We offer two double ensuite rooms, one has an extra bed in it (making it a triple room). 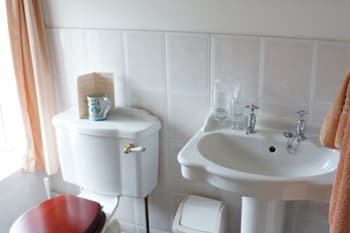 We also have a twin room with private downstairs wet room. The last two rooms may be booked together to form a family suite sleeping 5 people with ensuite. Breakfast is on a help yourself basis with cereals, toast, fruit juice, tea and coffee laid out for you Bacon and eggs are in the fridge. Families staying for several nights or who cannot go out because of small children's bedtimes may arrange to have a takeaway. You may walk everywhere in the National park. There are cycle routes and opportunities for riding, fishing in lakes and the sea, and coast walks and beaches within 15 minutes drive. There are no rooms available at Heather Cottage for these dates. The Garden Bedroom has a double (kingsize) and a single bed. 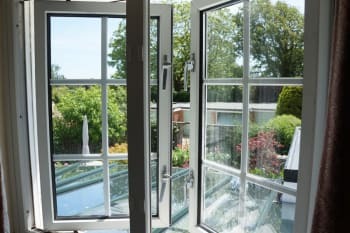 It is located at the back of the house, overlooking the garden and fields. 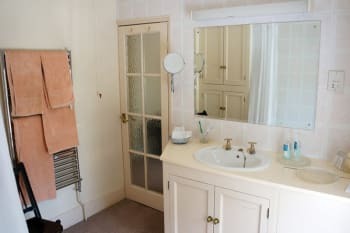 This bedroom has an en suite shower room with shower, lavatory and basin. 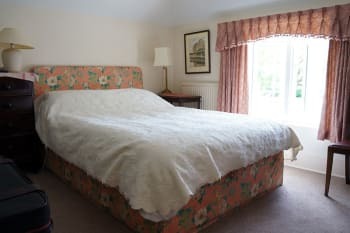 The Heather Bedroom is a lovely bright double (kingsize) bedroom located at the back of the house, overlooking the garden and the fields beyond. 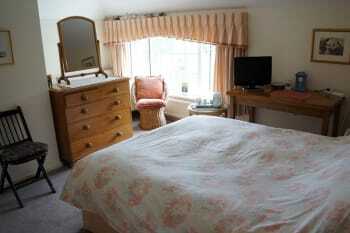 The Forest bedroom is lovely bright twin bedroom upstairs overlooking the front of the house towards the forest. Very good pub/restaurant in easy walking distance. Food excellent and very large portions. Beware having too large a 1st course/starter! We had a wonderful four- day break, staying in the Garden Room at Heather Cottage. It’s in a quiet setting, just what we needed. The room was very clean and contained everything we required, including bath robes. 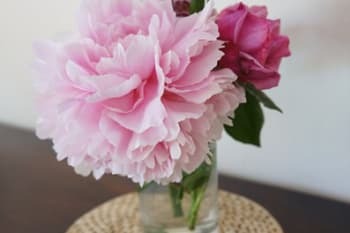 We even had cut flowers from the garden. Henrietta was the perfect host, cooking us a good breakfast every morning at times which we agreed. She also advised us on local walks, some of which we had not previously known. We hope to return there next Spring for a longer stay. Good food and service at the Hare and Hounds about ten minutes walk. Local store and post office in the village. All very friendly. Pleasant lady and good host. I found Henrietta the host very knowledgable of the area. Our stay was exactly the type of relaxed and quiet short break we were looking for away from the city. The room was very comfortable, the breakfast delicious, and everything was clean and efficient. Thank you. The Hare and Hound nearby is nice and lively with good value pub food. The Shipyard Fish Market, Bar, and Kitchen in Lymington was a nice afternoon pitstop after a walk through the town, market, and the seaside. What a lovely lady Henrietta is. 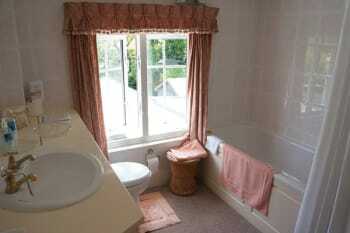 Most welcoming and heather Cottage is a warm, friendly place in a gorgeous location. A couple of lovely pubs nearby, great for families excellent food. Sway itself is very quiet. Thankyou both so much. Great to have you, come again! A late choice by us when we found we had a couple of days free of other commitments. The room was smallish but more than adequate for a couple of days. The use of the downstairs wet room was less a problem than we thought. Henrietta was very helpful and made our stay very enjoyable. We live quite local to the forest but we know there are several good pubs and some restaurants close by and lots to see and do depending on your interests. Thank you Henrietta for a wonderful stay for me ,my husband and 9 year old son. It was a lovely relaxing break and Henrietta could not have been more helpful and welcoming. Hare and Hounds pub in Sway excellent but book in advance. We had a very pleasant stay at the cottage & the owner was warm & welcoming.Would definitely recommend the stay to our friends. Visit The Mill at Gordeltn for a lovely meal in an equally lovely setting. Would like to return. We were made very welcome with our dog and treated to lovely tastey breakfasts. Silver Hind and Hare and Hounds both very friendly. Coastal walk and Lymington. Beaulieu for a full day out. 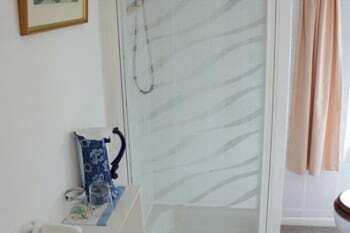 As a sole proprietor of a B&B facility, Henrietta stamps her own mark on all aspects of running this type of business, she incorporates all of the above with her own brand of caring, friendliness and general support, whatever your needs. She helped make our stay particularly enjoyable. If you are new to the New Forest, make sure you explore as much as possible. If you are a dog owner there are unlimited walks, many off-lead. 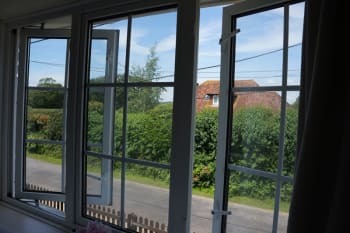 Changes of scenery can be found at Milford-on-sea or Christchurch, both a short car journey away and Christchurch beach (Avon, say), which is lovely is also dog-friendly in the autumn & winter. There are a wealth of Pubs & Restaurants around and if you want the shortest travel after a tiring day the Hare & Hounds, just half a mile away, satisfies most eating needs. Very welcoming and friendly, clean, comfortable and good breakfast. Must eat at the Hare & Hounds. My wife and I were made to feel very welcome despite turning up an hour early. Our host, Henrietta, was lovely and happy to supply trip ideas. The accommodation was clean and comfortable with TV, and fast, free, wi-fi available. The New Forest Breakfast, using local produce, was excellent. We are happy to recommend Heather Cottage to others as a quiet place to base yourselves. Heather cottage is a delightful b@b set in our favourite part of the forest with superb walks and cycle rides right on the doorstep. Henrietta keeps the b@b spotlessly clean and cooks a lovely full English in the mornings. We had excellent weather and were able to enjoy breakfast in the cottages gorgeous sunny walled garden which is packed with beautiful and fragrant plants. We will certainly be going back as soon as we can. Charming New Forest B&B run by a charming, hospitable lady! Clean, comfortable and excellent cooked breakfast. Lots of interesting books on the shelves which you can read while you stay, and our dog was allowed to stay and sleep in our room ( though we did cover the bedding with an old sheet as he likes to sleep on the humans' bed!) We love it here - this was our second stay. The Forest is right on your doorstep for walking, cycling etc and great for dogs. Sway is well located in the New Forest, close to Brockenhurst and Lymington. 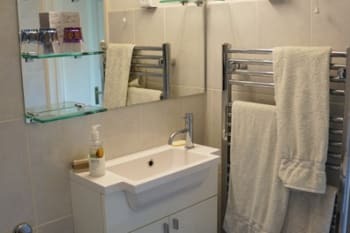 Heather Cottage is around a 15-20 minute walk from the centre and train station. Henrietta is very welcoming and friendly and happy to recommend places to go. Room was very clean and comfortable. Tried two of the local pub/restaurants - Hare and Hound was closer, with good food, if slightly haphazard service (food delivered without cutlery, at one point over half the tables in the bar were full of empty plates uncollected). Better was the Silver Hind, offering very good, friendly and efficient service, and excellent food (beef short rib). There is a lot to do in the new forest,there is a pub in the town that has a goon menu at a fair prise, you can also take a walk around the forest, there you will find a number of pubs that do good meales. If you go in the winter months you need to have a torch. This is a superb location for exploring the New Forest. Once out of the front door you are on the forest. We loved out stay here and so did our Springer Spaniel dog. Location was perfect, right on top of the forest - exactly what we wanted. Rooms were lovely and clean and had everything we needed - the free WiFi was really handy. Henrietta was very welcoming and hospitable and allowed us to arrive late in the evening. She cooked a beautiful breakfast, gave us great advice on where to go/what to see and even directions to the local pub. She also left milk & water in our rooms so we could make ourselves a cup of tea. Our dog was even allowed into the breakfast room. Nothing was too much trouble! Visit the Hare & Hounds pub - a 5 minute walk away. Very family & dog friendly and great food and drink. We visited here both nights we stayed. The new forest is on your door step so expect to see wild horses in the roads and beautiful scenery everywhere you look. 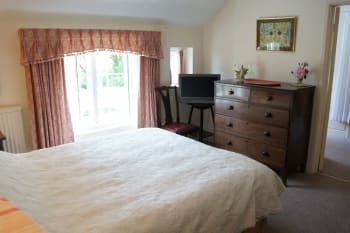 This is a most charming place to stay.The breakfast is delicious.Our room was very comfortable and had a lovely view of the garden.The owner Heather was very helpful and great to talk to and a great cook.Thank you for a very comfortable and happy stay. Just explore this wonderful part of England. Beautiful views and lovely restaurants. Friendly and made to feel at home. "Hare and Hounds" for food and drink, 10 minutes' walk away. Enjoyed our stay very much. Henrietta gave us a warm and friendly welcome and looked after us very well. Lovely breakfast, comfy bed, spotlessly clean. 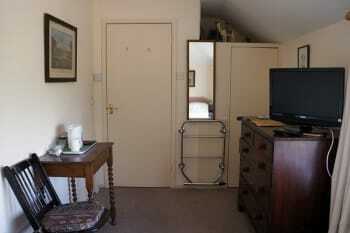 Easy access to New Forest and to the Hare and Hounds which serves excellent meals. How very kind of you, Heather and Martin. Great to have you! Cannot fault any of the above! Host Henrietta very welcoming and friendly and her cottage charming, interesting and extremely comfortable. She also has a very pretty garden. The breakfasts excellent and cooked to order. An added bonus for us was that we had our young family renting her holiday cottage next door so we were able to spend some time with them without getting under their feet ! Had some lovely trips out around the New Forest and to the nearby coast . Something for everyone. There are two decent pubs in Sway, catering for families, with gardens, food and good beer. The nearest less than 10 mins walk away. As ever the ponies, donkeys, cows etc wandering around are a source of great amusement...but don't forget some sturdy footwear and remember to change it at the door! Henrietta was a lovely and very accommodating host, the rooms were clean and comfortable, our sleep was a bit hot due to brilliant sunny hot days (can't complain about that though). Waking up with a wonderful view and a good hearty breakfast to order was just what was needed for me and my wife to chill for a couple of days. The only bit I'd have liked to be different was not having our shower and toilet downstairs, we had exclusive access. So really it wasn't a big deal. Lovely place! Go to Brockenhurst and hire some bikes and ride the trail down to Milford on Sea. Mid level riding and a wonderful way to see the New Forest. I would say for ages 8+ as there are a few roads (not overly busy though). Recommend the Horse & Hare and the Silver Hind in Sway as good eateries. A very relaxed stay. Felt right at home.